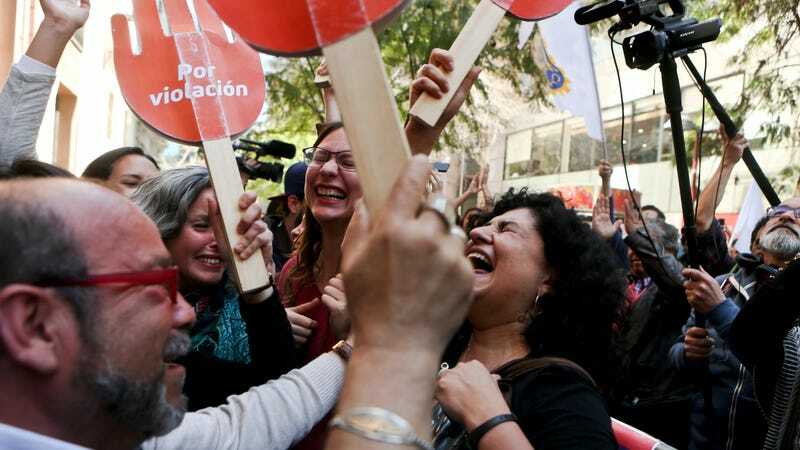 A Chilean court made a landmark ruling today when it voted to roll back the country’s total ban on abortions, permitting the procedure in a limited number of cases for the first time in 30 years. The former head of U.N. Women, Bachelet has made abortion rights a centerpiece of her agenda, despite aggressive opposition from certain factions of the devoutly Catholic country. “What has prevailed is tolerance, and that every woman may make decisions based on her values, religion, principles or real options,” Bachelet said during a news conference. Chile allowed abortions in certain cases under its 1931 health code, but outlawed them entirely in 1989 under the dictator Augusto Pinochet. But as is often the case, the ban didn’t prevent abortions from taking place: The BBC points out that up to 70,000 illegal abortions were performed annually in Chile, often via a pill intended to treat ulcers or by medication acquired from the black market. The New York Times reports a jubilant air outside the court building as the vote was made public. Among those interviewed was Karen Espíndola, who after being denied an abortion in 2008 gave birth to a son with an incurable chronic illness, dying when he was just two years old. Abortion remains completely illegal in El Salvador, Nicaragua, the Dominican Republic, Malta and The Vatican.